Pender Island (Saanich: st̕ey̕əs ) is one of the Southern Gulf Islands located in the Gulf of Georgia, British Columbia, Canada. Pender Island is approximately 34 km2 (13 sq mi) in area and is home to about 2,500 permanent residents, as well as a large seasonal population. 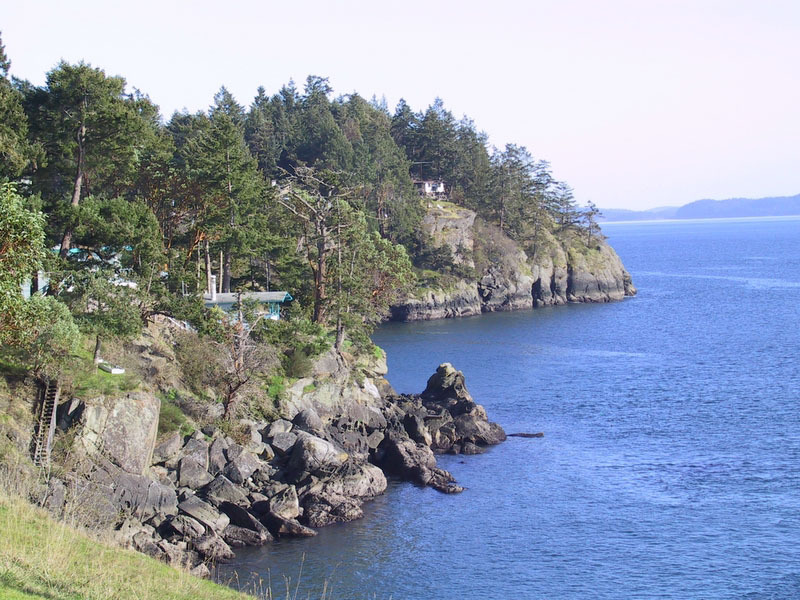 Like most of the rest of the Southern Gulf Islands, Pender Island enjoys a sub-Mediterranean climate and features open farmland, rolling forested hills, several lakes and small mountains, as well as many coves and beaches. Pender Island consists of two islands, North Pender and South Pender, which are separated by a narrow canal originally dredged in 1903. In 1955 the islands were connected by a one lane bridge, as it remains today. Most of the population and services reside on North Pender Island, with the highest concentration surrounding Magic Lake. South Pender Island is generally more rural, but includes the Poets Cove Resort and Spa, formerly known as Bedwell Harbour Island Resort. At the time of European Contact, Pender Island was inhabited by Coast Salish peoples speaking the North Straits Salish language. There is an Indian reserve at Hay Point on South Pender Island, which is home to members of the Tsawout and Tseycum First Nations. The Poets Cove Resort was built on an ancient First Nations village site. The provincial government's 2007 settlement with the Tsawwassen First Nation included hunting and fishing rights on and around Pender Island—an arrangement to which the Sencot'en Alliance objected, saying those rights are theirs under the 1852 Douglas Treaty. Sencot'en placenames on Pender Island (st̕ey̕əs) include ʔiləčən (Bedwell Harbor), and x̣ʷəl̕isən̕ (Port Browning). On North Pender Island: šxʷsəɬqʷsət (Shark Cove), x̣ʷəx̣ʷiʔéčsəŋ (Shingle Bay), kʷeqsən (Stanley Point), kʷeqsən (Boat Nook), təlasəŋ̕ (Hope Bay), sq̕ʷəq̕ʷiŋ̕əs (Oaks Bluff), q̕eʔƛ̕əŋ or sq̕eʔəƛ̕əm (Otter Bay), and x̣ʷiʔx̣ʷnəčénəm or sx̣ʷix̣ʷθəʔ (Wallace Point). On South Pender Island: sk̕ʷən̕enxʷ (Gowlland Point), and smanəč (Teece Point). A Spanish expedition led by Francisco de Eliza visited Pender in 1791, naming it "Ysla de San Eusevio". The islands, along with Pender Harbour on the Sunshine Coast, were given their current name by Captain Richards for Staff Commander, later Captain, Daniel Pender, RN who surveyed the coast of British Columbia aboard HMS Plumper, HMS Hecate and the Beaver from 1857 to 1870. The first permanent resident of European descent arrived on South Pender Island in 1886. Pender Island is a popular destination for fishing, boating, scuba diving and other outdoor pursuits. The island also boasts a 9-hole golf course. In 1937 several Pender residents put up money to purchase a 60-acre (24 ha) parcel, on which to develop the course, from George Grimmer, a son of Pender pioneer Washington Grimmer. These first individuals and many others took out memberships as well as planned and developed the layout of the golf course. Incorporated as a society in 1945, with the exception of a brief hiatus during World War II, Pender Island Golf Course has existed ever since. There is also a 27-hole Disc Golf (frisbee golf) course (Golf Island Disc Park) close to Magic Lake. This course is well known in the Disc Golf community and is the site of many tournaments including The Republic of Pender Invitational (The Ropi) and the Pender Island Invitational. There are numerous art galleries, shops, restaurants and local events to frequent on the North and South Islands. Summer is generally a busy time, while the island pace slows down considerably during the winter months. Spring and fall are pleasant times of the year, with fewer tourists and mild weather. The Pender Post, Islands Independent, and the Island Tides are locally-published independent newspapers.